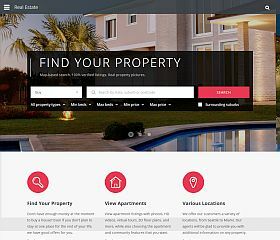 Property Management is a very flexible and adaptable HTML template for creating a website. 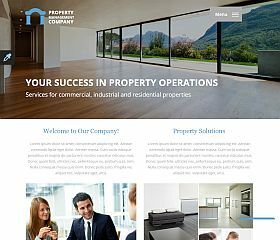 Whether you’re a property management company or real estate developer, you will find that this responsive, parallax template will give you a modern and professional image that conveys trust and credibility. 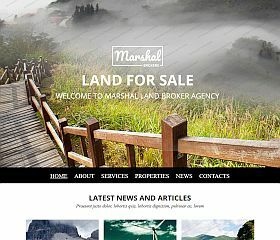 Land Brokers features a clean and responsive design that includes a large, full-width header image area, and an uncluttered layout – you can share all of the information and content you might want with this modern website template. 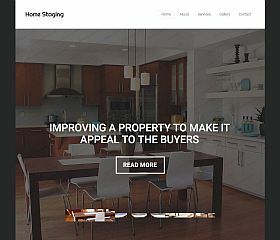 Home Staging is an HTML template that incorporates a number of features and visual qualities that are sure to make an impression on you and your visitors. The template is completely responsive and adapts easily to nearly any size screen, features HTML5 and CSS3 coding, a parallax design effect, a large featured content slider on the homepage, sticky header/navigation menu, contact form, and more. 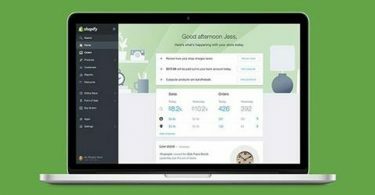 Easy Living was built using the latest Twitter Bootstrap release and is based on the 1170 grid system, giving your website best-in-class coding and modern technology compatibility. 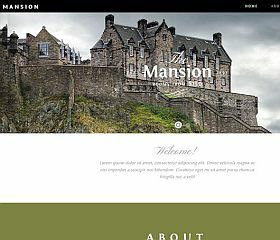 This template is responsive, robust, and beautiful to use and view. Properta is a flat-style designed website template that is retina-ready and fully responsive – and is equipped with a striking Google Maps background header. 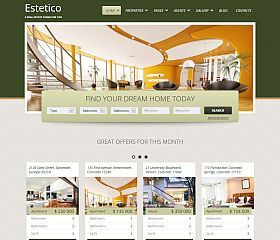 Estetico Real Estate is a website template designed for real estate, built using HTML5 to keep it current with the latest development trends and gives it the responsive layout modern sites need. The template comes equipped with three different color schemes, layout options, and jQuery enhancements. 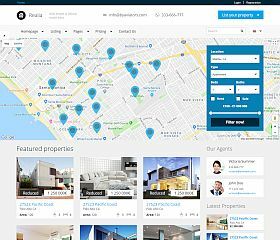 Real Estate is a creative HTML5 website template that includes 9 different pages, PSD files, responsive layout, and much more. The design will give your site a modern look and feel. 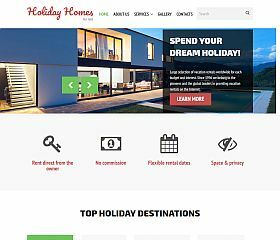 Holiday Homes for Rent is a very versatile and attractive website template, this solution can be used for vacation rental companies, property management businesses, and many others in the real estate field. 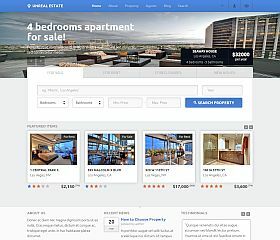 Unreal Estate is a website template for real estate that is responsive and includes many different option and features for displaying your properties. The package also includes nearly two dozen different page templates for you to use in your design. 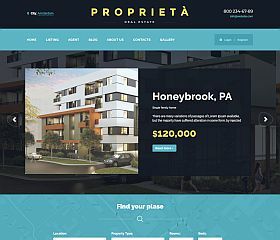 Proprieta is a responsive and Retina-ready template that utilizes a flat-style design as well as bold typography and imagery to deliver an ultra-modern solution for real estate professionals. If you’re wanting to convey trust and professionalism while staying on the leading edge of technology and design – then this would be a great choice to impress your clients and potential customers. 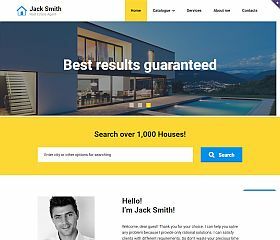 Real Estate Agency boasts features like Google Maps and Fonts integration, a responsive layout and design (that looks good on all screen sizes), built-in contact form, and more – this template will leave an impression with your visitors. 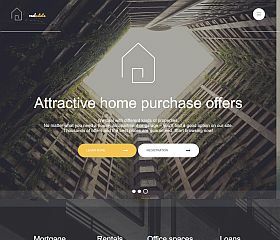 Real Estast was designed for real estate companies or websites, yet flexible enough to work for nearly any type of site or business – this website template gives you a world of options at your fingertips. 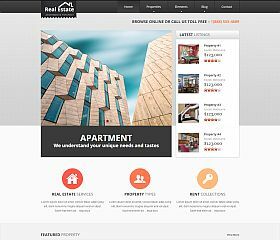 Real Estate Agency Responsive HTML template gives you a cutting-edge and minimalist design template for your business. With a super fresh design that takes advantage of ample whitespace, it will give you a look that sets you apart from the competition. Zoner provides functionality and features designed to ensure your site looks great across all devices. 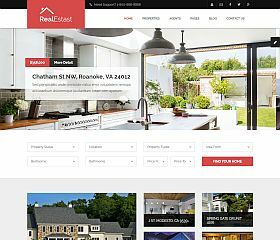 A powerful and robust real estate template, it includes incredible features like: property sliders, parallax map, support of OpenStreetMap and Google Maps (one of the first of its kind to do so), and a handful of other customization options that make customizing and administering your site easier than ever before. 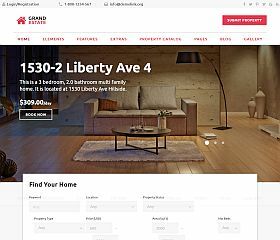 Real Estate for Rent is a template that provides you with a quick, simple, and elegant website template to showcase a single property. With a responsive layout, it provides a polished landing page that will help you generate interest in your listing. 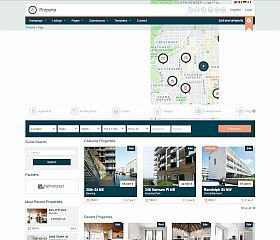 Real Estate Agency features a responsive layout and design, featured content slider, built-in contact form, integration with Google Maps, and many other features – this template gives you a crisp and refreshing design that is both easy to manage and easy to navigate. Sweethome delivers beautiful aesthetics, easy navigation, and functionality to deliver a site that both you and your clients will love. It utilizes the latest in web development trends including retina-ready images, responsive layout and design, CSS3, and integration with FontAwesome as just a few of the template’s showcased features. 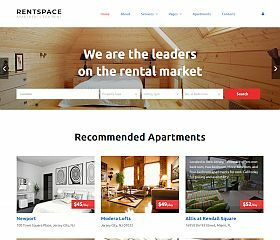 RentSpace design highlights include an ultra-clean design, responsive layout, sticky navigation bar, parallax design elements, and even video backgrounds. 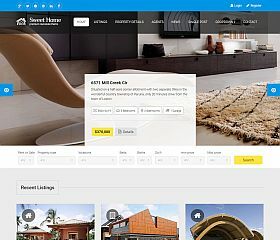 If you’re in the property/room/apartment rental industry – this template will give you a state-of-the-art site that conveys trust with your guests. 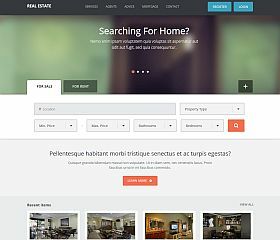 Realia is a real estate template for those looking for a cutting-edge website template for their real estate company or site – equipped with everything they need, with a responsive layout, retina-ready design, and much more. Grand Estate gives you a cutting edge design that is clean, professional, and uncluttered. With multiple templates included, header and footer variations, blog section, multiple listing views, agent pages, and more – it is an all-in-one-solution for real estate agents, agencies, brokers, and professionals. 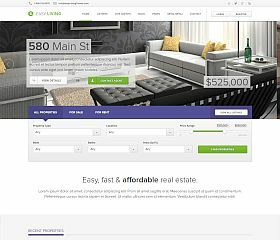 Real Estate has a minimalist layout that provides easy navigation and customization options are featured in this real estate website template. Using enhanced coding features like jQuery, HTML5 and CSS3, and a responsive design – it keeps you updated with the most current design trends. Homefy was built on the popular Twitter Bootstrap framework, this responsive template delivers a great-looking design that conveys professionalism to your clients. With 8 unique color schemes to choose from, 8 different page templates, and Google Fonts integration – it’s the perfect choice for launching your site. 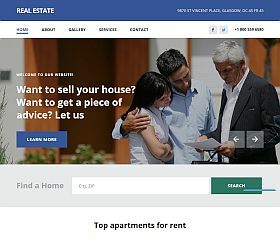 Real Estate is a template that comes with design features like parallax scrolling elements, a sticky navigation menu, and responsive layout – you can ensure that your site looks great and works across screens of all sizes. 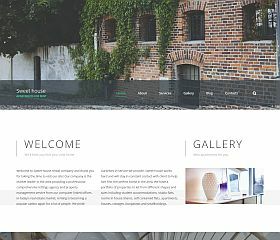 Sweet House is a template that comes with built-in contact form, Google Maps and Fonts integration, responsive layout and design, photo galleries, and more – this makes the perfect foundation for your real estate site. 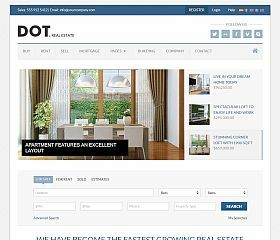 DOT Real Estate is a responsive HTML5/CSS3 template that provides the perfect solution if you want to buy, sell, or rent properties online. Whether you’re a real estate company, agent, mortgage company, real estate appraiser, leasing service, or any other type of website or business in the real estate industry. 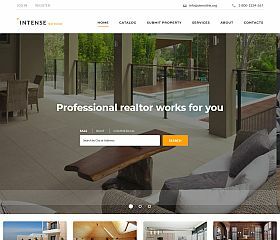 INTENSE Real Estate is a modern HTML template for real estate websites that will give you a professional and polished look that will surely impress your visitors. 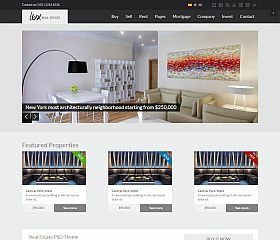 Lux includes a huge number of features and options at your disposal, you can create a truly spectacular website with this real estate template. Get an edge on your competition with the responsive design, mortgage calculator built-in, and much more. 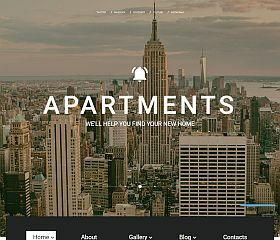 Apartments is the perfect web template for rental agencies, property management companies, and apartment rentals. Choosing the best template or design for your real estate website can really be a daunting task. 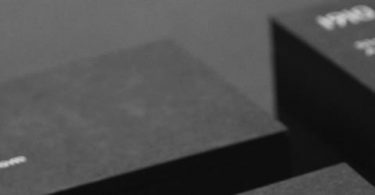 If you’re trying to find a good free design, you may find yourself faced with lackluster features, coding, or support. 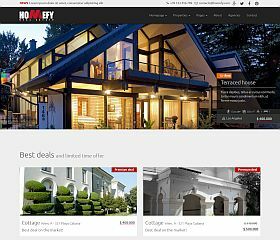 However, there are a handful of really great real estate templates for you to choose from that offer everything you might be looking for whether it’s a responsive layout, retina-ready design, property search box, or enhanced features like jQuery or HTML5 and CSS3. They’ll not only give you what you need to set up your site, but the design will give you a modern and professional look – whether you’re a broker, agent, web portal, or real estate company. While there are many options available to you when trying to find the perfect design that suits your needs (whether you’re looking for a free or premium template), I highly recommend taking a look at one of the paid templates as they typically offer features and functions not found in their free counterparts. For the price (many on this list are below $20), you really can’t beat the quality that you get. 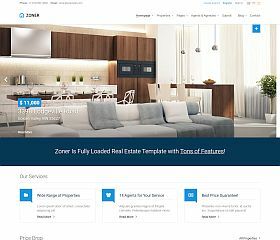 As you can see, there are quite a number of templates available for the real estate industry – from the clean and simple to the powerful and complex. Whether you’re launching a brand new site or giving a makeover to an existing one, the choices rounded up here offer a very affordable way to present a professional site to your visitors. For those looking for a more dynamic solution, you might want to consider WordPress to run your site (you can also check out some of the great real estate themes available) – as it provides enhanced features and functionality that you might not find in a standard HTML template.